It is Monday. It's still supposed to be summer, but it's gloomy, wet, and 68 degrees outside. Rather than complain about the needed rain, I'm channeling the "meh" into planning my weekend menu. While imagining I'm on vacation. What if you could have something for breakfast that was delicious and gorgeous, and made you feel like you were on a tropical vacation? WITHOUT the excessive, energy-spike-crash, body-wracking amounts of SUGAR and nasty carbs that are in most breakfast foods? PLUS a bunch of antioxidants, and, a boatload of rev-your-metabolism NUTRIENTS while doing it? And enough PROTEIN to keep you stable? Behold... this breakfast bowl. I've made about 4 versions of it this summer and can't wait to share them all. But first...a rant on the typical, trendy "superfood breakfast bowl" (i.e., desserts with benefits). Any food that is authentically non-American, OR, über-creative and healthy rocks my world. The first time I heard of an açai bowl (say: AH-sigh-EE) was when my sister traveled to Hawaii years ago, and texted back photos of her tropical culinary adventures that she knew would make me quite envious...and giddy at the same time. My super sugary but delicious custom Açai Bowl from Juice Infusion on Venice Beach, CA. I picked toppings of Goji berries, strawberries, blueberries, almond butter, granola, and cacao nibs. My first açai bowl experience was on the West Coast (Cali, baby) and then again on the East Coast (sunny FL). Like everything else novel, it was several years until the food joints of the No Coast finally got on board. For those No Coasters who aren't yet familiar, the idea is that you take this incredibly nutrient-dense superfood berry called açai from South America, you freeze it, blend it up like a thick smoothie, put it in a bowl and top it with tons of whichever random healthy toppings you choose! Move over ice cream sundaes and fro-yo... we've entered a New Era of pick-your-toppings indulgence. Yes - this is like an ice cream sundae. If your bowl has been Americanized, it is CHOCK full of sugar...Rather than a healthy breakfast bowl, this is simply "dessert with benefits." Here's the thing. I'm sure that in Brazil or wherever this originated that this was healthy. That Brazilian-looking picture above looks pretty legit. But, like everything else good and wholesome, we've Americanized the superfood trend. Thus, the darned sugar content is just as high as the antioxidants...giving this a superfood boost a hefty price tag that your pancreas has to pay. Regardless of whether you "add sugar" or not, eating a ton of fruit is just ridiculous when you're an American. Being an American means we're genetically predisposed to eat carbs (i.e., pre-incarnate SUGAR) and sweets as though there's no tomorrow. And we wonder why our "tomorrows" get harder and harder...and fewer and fewer. Just like everything else in America, we over-do it on the fruit. Royally. There isn't a single godly-and-truthful reason to add fruit juice to a smoothie (fruit+fruit+more fruit) and call it healthy. Most juice is pure sugar, and is so hard on our bodies. FRUIT IS FULL OF FRUCTOSE, a sugar that, unless eaten sparingly, overtaxes your pancreas and contributes to overgrowth of bad bacteria and yeast (candida). So... unless you enjoy IBS, constipation, bloating, low energy, yeast infections, parasite infections, diabetes, cancer, adrenal fatigue, or the like... sugar (even fruit sugar if you eat like an American), is NOT your friend. Before you hit up Smoothie King, Jamba Juice, or anywhere else claiming to be "healthy", check out those Nutrition Facts on their online menu. It's MINDBLOWING. Yes, it's a good idea. But the excess sugar just kills it. Pepsi : 0 nutritional value, is HORRIBLE for your brain and pancreas (Diet Pepsi is far worse! ), with 41g sugar. McDonald's Strawberry Shake : lots of dairy soft serve, almost nutritionless strawberry goop, and 71g of pancreas-crushing sugar. Smoothie King's Açai Adventure smoothie, size small (20oz): a tiny bit of protein, acai antioxidants, some vitamins from the fruit, and an ASTONISHING 86g of sugar! Jamba Juice's Açai Bowl : a little protein, acai antioxidants, lots of carbs, some vitamins from the fresh fruit, and a whopping 67g of sugar. Hold your horses. I'm not saying Pepsi is good, and I'm not saying that açai bowls are worse than ice cream. They're NOT. There are great benefits inside that sugar bomb. Given the choice between a donut and a fruit bowl, CHOOSE THE FRUIT. Obviously. But again...moderation is not an American lexeme. We NEED the nutrients in fruit, yes, but most of those gems of nutrition we are supposed to be getting come in guilt-less vegetables. Problem is, we're so addicted to sugar (and CARBS...which turn to sugar immediately) that we have no appetite for vegetables and barely get 2 servings a day of those nutrient-dense greens and veggies. We really need 5. Bummer. BLEND those veggies in to your breakfast. (NO - you can't taste the spinach in here!) And add protein. You'll stay full longer, and won't suffer that 11am "I feel nasty and need a nap" effect that other breakfasts have. Typical American smoothies (and smoothie bowls) don't have enough protein to be a meal, and have to use tons of fruit (=sugar!) to thicken the liquid. 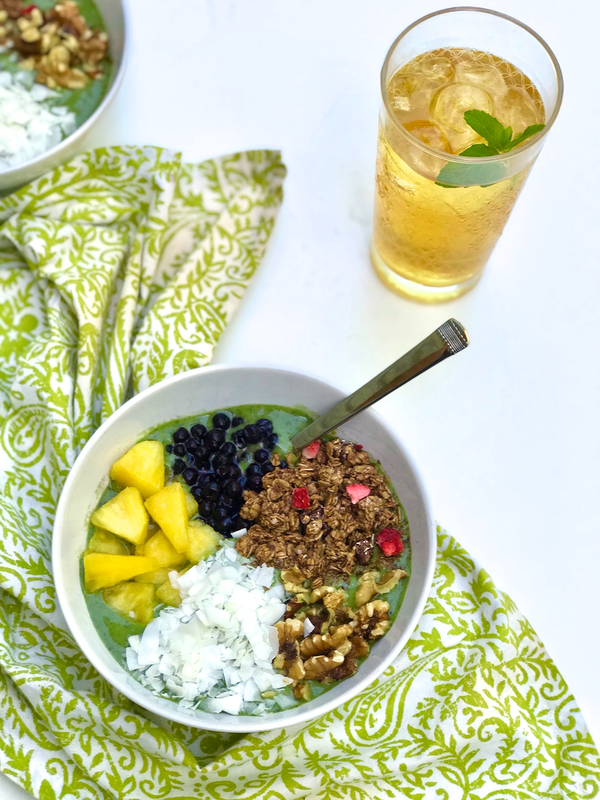 Superfood Thickeners: By using spinach, flax seeds, and chia seeds to add thickness to the smoothie bowl base, you won't need that excess frozen fruit. And you have UNBELIEVABLE nutrients like Omega-3s and other things with benefits I'm so geeked out about I just have to stop now or this will be 10 pages long. Protein: You need protein in your breakfasts, like 20g at least. Find a protein powder that has no artificial sweeteners and tastes delish, and make it your breakfast go-to. I LOVE this Tera's Goat Whey Protein Powder since we don't do much cow dairy here. Low Sugar: This smoothie has just 34g of sugar, with NO added fruit juice or sweeteners. You can even remove the banana (14g sugar) if you want, and double the flax and chia, adding Stevia till it's sweet. Toppings: Add whatever nuts, crunchy things, or superfood add-ons you like!! Don't overdo the fruit on top though. I ADORE the Love Crunch brand Dark Chocolate with Red Berries granola (Costco! ), because it's like Valentines Day all year round. But low in sugar.